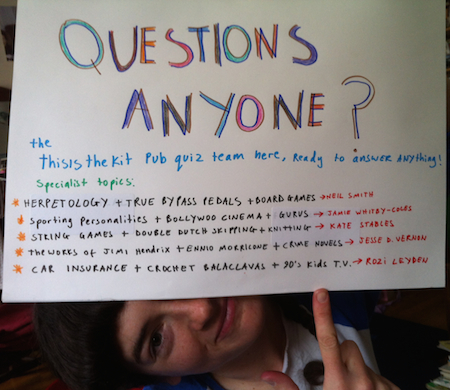 This year's been a doozy for This Is The Kit (aka Kate Stables and whoever joins her aka TITK for short). We released their new, Aaron Dessner-produced album Bashed Out in April. (Vinyl came along a few months later and, hey now, links to get it in any format are here if you are so inclined.) Reactions have been universally positive, with some daring to call it one of the best British albums of 2015. (That "some" includes "us" of course.) We'll get into more details about the positive reviews in a moment but ***HEADLINE ALERT*** the BBC has even made a half-hour format documentary TV show about the project. It debuted last week, as one of the first episodes in a new series called Music Box with Guy Garvey. If you're in the United Kingdom, you can watch it right here, right now. Oh, what do you say? You're not in the UK? Well if that's the case you just got a warning message that says something like "Sorry mate, this programme is unavailable" (including the extra "me" in "program"). We're working on finding a way to show it to all you non-Brits, but for now please content yourself (no pun intended) with watching "Silver John," the second video from TITK's new album Bashed Out which had its debut on the show. Vice's Noisey site gave it an online premiere, writing that the band "use lyrics not to tell stories exactly, but like silhouettes of experiences, tracing fears and their unlikely roots" in this video "about Kate contemplating the apocalypse." We took this as a positive notice, given it's about as poetic & sincere as Vice gets. And well-earned it is"Silver John" being the cheeriest tune about the end of the world that we can recall outside of Lou Reed's discography. Are you tired of the praise party yet? Do things called "praise parties" even exist outside of this here news post and weird religious contexts? Even pre-street date we knew there were good things to come when Manchester newspaper The Mancunion gave This Is The Kit's live show a rapturous 9/10 review. Upon release date, Bashed Out received 8/10 album scores in Drowned in Sound, The Line of Best Fit, The 405 and UNCUT which called it an "understated yet absorbing work" (and, surprisingly, gave it a follow-up 9/10 rating in the next issue). Not yet tired of verbiage? Well, The Line of Best Fit said "Its hard to find fault with Bashed Out; timeless and completely modern all at once." Drowned in Sound added that "this album ought to see Kate Stables recognised as one of the most compelling voices in alt-folk," even doing that "s" in place of "z" (zed?) thing which we Americans find so charming. Across the pond, Pitchfork recognized (not recognised) how Kate had "a complex and compelling personality, spiking her folksy whimsy...with shots of prickly wisdom" continuing on that "Stables' concerns are microcosmically personal, trading in minute details and small observations that provide immense contentment. After almost a decade presenting herself as This Is the Kit, she has learned to root her music firmly in her own quirks rather than in the demands of any particular genre or trend." We thought that was well-put, though we will admit Kate later bowed to one trend, answering a bunch of your questions in one of those newfangled Reddit AMAs. Here's an image that will speak to any of you who actually know what an AMA is. And what does the rest of 2015 hold for TITK? Through September, a number of festival dates will take them around the UK (including the End of the Road) with stops in in Cork, Ireland and the Netherlands. After that the band plan to wrap up 2015 with this run of UK tour dates, including their biggest headline show yet at London's Scala. You should go. We hear the praise party will continue. And no, you won't have to wear a head covering, nice shoes or other formal attire to join in.